Hello everyone! I am so happy to share all about my travels and experiences as an American living in a developing country. My name is Emily Mick and I am a special education teacher living and working in the Dominican Republic! I moved here about 8 months ago to pursue my never-ending lust for adventure. Growing up, my parents made it a point to take family vacations once a year. We went everywhere from the Black Hills of South Dakota to the beautiful beaches of Maui and San Juan, Puerto Rico. I remember looking forward to our family adventures and always anxiously awaiting the next one. I went to college at Iowa State University to become a special education teacher. During the summers, I was fortunate enough to work for Camp Adventure Youth Services. Camp Adventure is a program that trains summer camp counselors and places them at military bases all around the world to provide programming for the children living on base. I worked in Pearl Harbor, Hawaii, Ansbach, Germany, and Vicenza, Italy. After those experiences, I just knew I would never stop wandering. I really appreciate that you wanted to tell us a little about the Dominican Republic, a place I have never been to and which I am eager to learn more about. How did you decide on this location? Once I decided on moving to another country, my final decision came down to my craving for something new. I had never been to a developing country before and I had just barely dipped my toes in the Caribbean. The idea of living on a tropical island, where I could experience warm weather, a new culture, new foods, and a somewhat new language sounded amazing. And the fact that I was able to continue working as a special education teacher was simply too good to be true! How did you get there? Where did you stay? How is the transportation there? Did you use any agency, activity package, a guide or you did it all yourself? 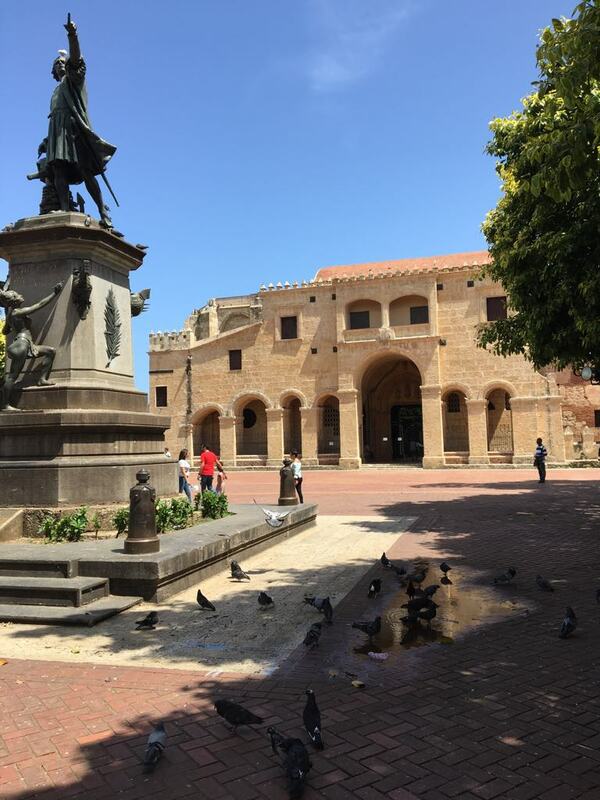 My family lives in Chicago so I flew into Santo Domingo from the O’hare airport. When flying here, you will almost always have a layover in Miami. The trip was only around 5 hours total. Not bad for an international flight! Because I actually work here, I live in an apartment in the city. However, when I travel around the island I always rent an Airbnb. There are so many options and you can save so much money! One thing I am extremely thankful for is Uber. I use Uber all the time in the city! There is also a subway that runs a route up and down the main interstate in the city as well as buses, public cars, and motoconchos which are public motorcycle taxis. If you need to get somewhere, there are many options for transportation. When we are traveling longer distances, we always rent a car. In terms of activities and tour guides, I have booked travel excursions through various online companies for things like snorkeling and waterfall hikes. However, when I first arrived, I did everything on my own. I used my coworkers at school as tour guides and just learned how to manage from there. Could you explore on your own? Was there a language barrier? It is definitely possible to explore the country on your own. At first, I was a little nervous walking around by myself. I have never felt unsafe but I get lost so easily and my Spanish was pretty rocky. I quickly learned that the people are super friendly and do a great job attempting to speak Spanglish with me. Coming here, I was way more confident in my Spanish skills that I should have been. Dominican Spanish is very different than the Spanish you will hear in Mexico or Spain. They speak quickly and tend to drop the endings of words. I have gotten used to the Spanish but there was most definitely a language barrier when I first arrived. But like I said, lots of people are happy to help and very willing to take time and try to understand you. So don’t be afraid to sound silly! You would be surprised how many people want to try and learn English here. If you visit the North side of the island (my favorite!) you will meet many Europeans who have moved here to live a more peaceful and relaxed way of life. They love showing us around and introducing us to the best local cafes. Hostels and share houses are a great way to travel alone because they are really cheap and often have other young travellers who are looking to experience the same adventures as you! I have made some close friends over the last 8 months so I typically travel with 3 to 5 other people. Again, I am a teacher and do not make very much money so I like to cut costs in every way possible. What are some of the best spots to visit in the Dominican Republic? My favorite spot for a relaxing getaway is Las Terrenas. It is an adorable little beach town up North, right along the coast. It has great cafes for breakfast and lunch as well as really good seafood restaurants for dinner. There are some fun beach-side bars that play music and have good happy hour deals. This is where many Europeans live. I like it because you get a good taste of the Dominican culture through food and music but then you also get great Italian influence. Plus many of the Europeans have Airbnbs for low prices. I highly recommend Las Terrenas! 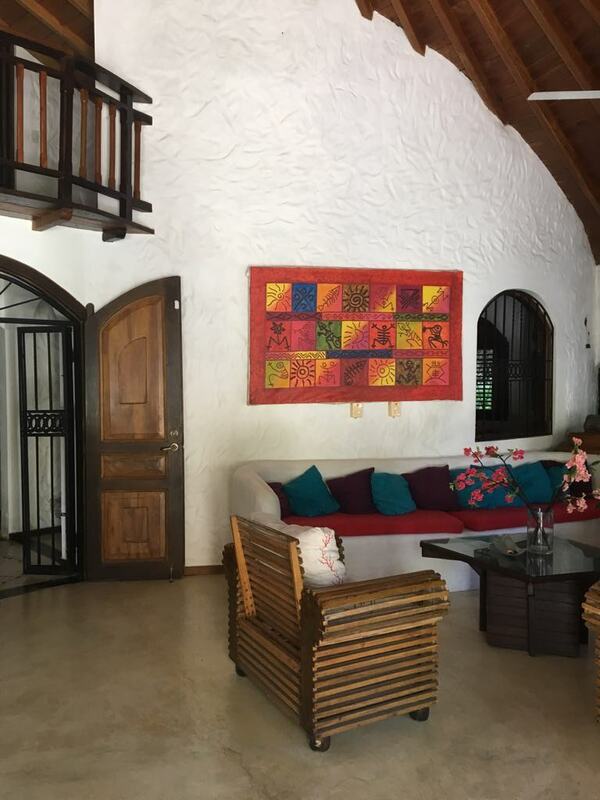 Also on the North side of the island is Cabarete and Puerto Plata. They are not far from each other but both offer great beach views and fun activities as well! Another one of my favorite places is Jarabacoa. This is a town about an hour and a half north of the city in the mountains. I was actually surprised to learn that there were mountain ranges on the island. I had no idea! 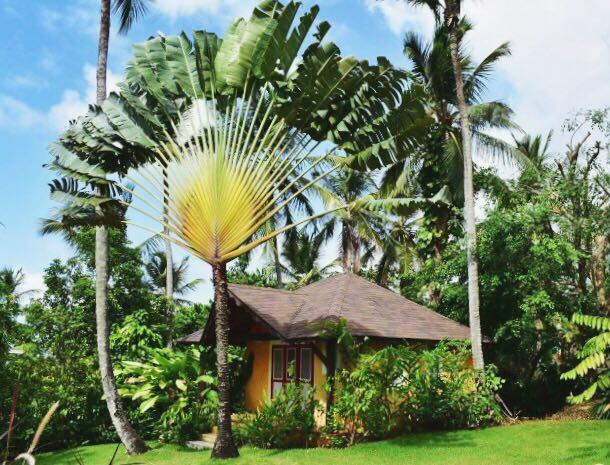 This is not your typical idea of a tropical vacation. But it is definitely worth visiting! The drive alone is absolutely beautiful. 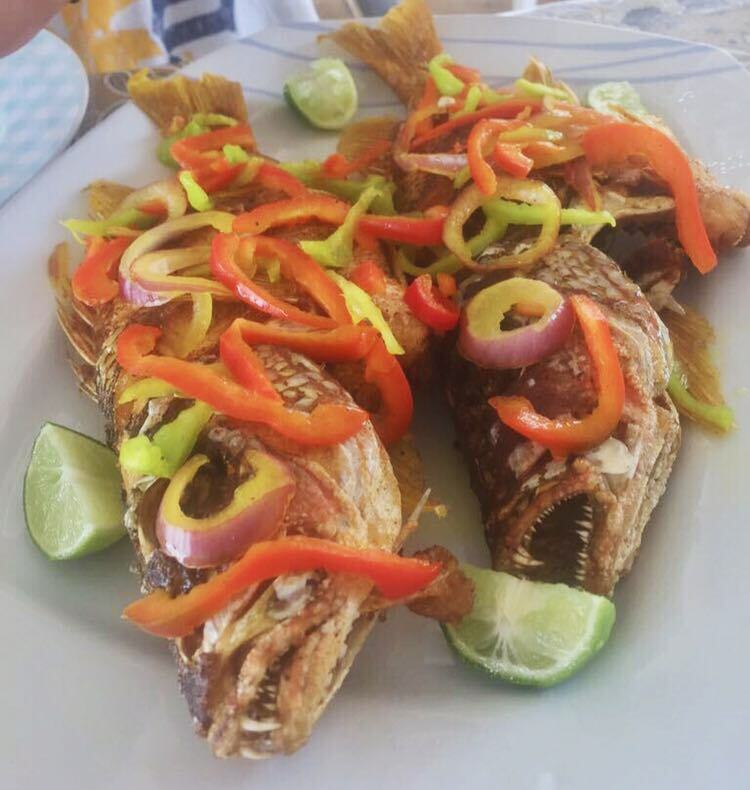 Once you arrive to the town, you will find authentic Dominican colmados and comedors. These are road-side restaurants that serve local cuisine. They are all over the city as well. Colmados are the perfect place to sit back, relax, and enjoy an ice cold Presidente beer after hiking in the mountains. But my favorite thing about Jarabacoa are the amazing sunsets. There is really nothing better than watching the sunset over the mountains. You mentioned Snorkelling and waterfall chasing before. What are some of the activities you enjoyed there? Of course, the first thing that comes to mind is the beach. Spending the weekends relaxing on the beach is a perfect way to wind down after a long work week. But I have also loved snorkeling, boating, and kitesurfing. 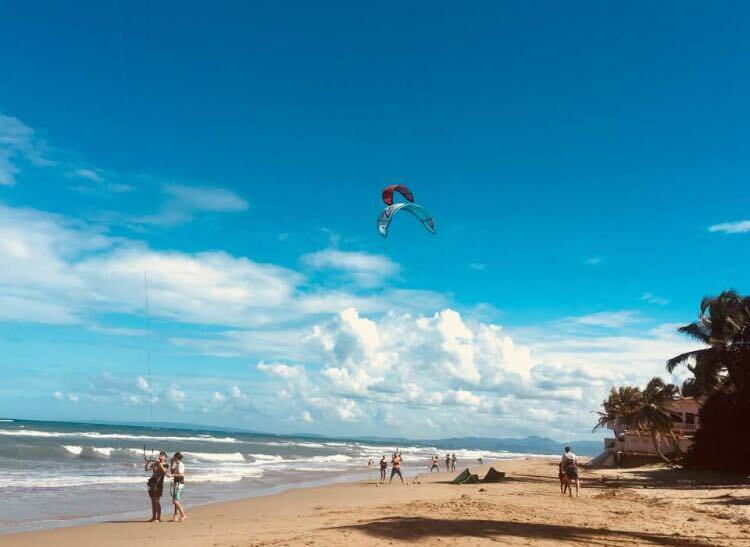 I took a kitesurfing course in Cabarete. It was so much fun to learn about a sport that I had never experienced before. I can’t say I was very good at it but I am looking forward to continuing to learn! 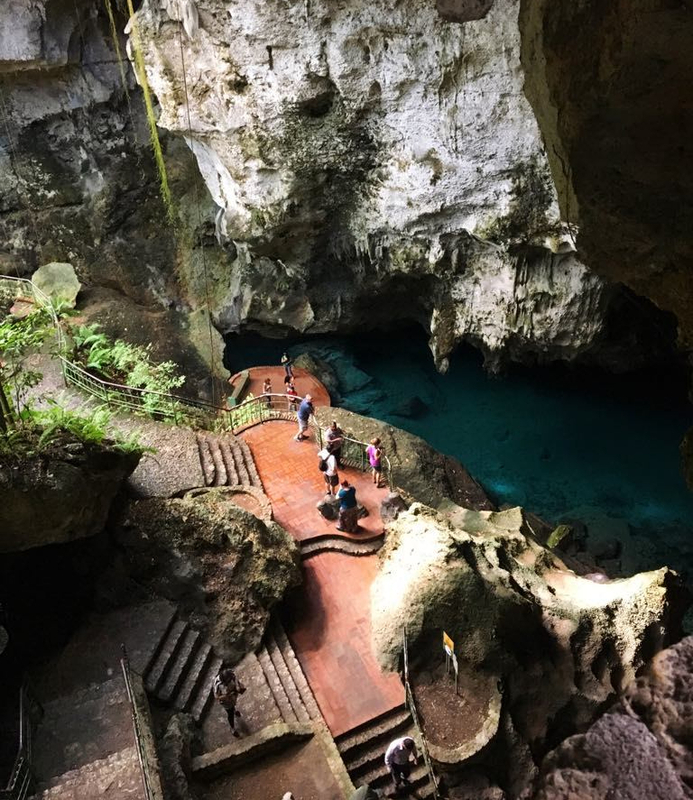 If you are spending time in Santo Domingo, you have to visit Los Tres Ojos! It is a protected area of caves and natural pools that are located underneath the city. This is probably the most unique park I have ever been to! 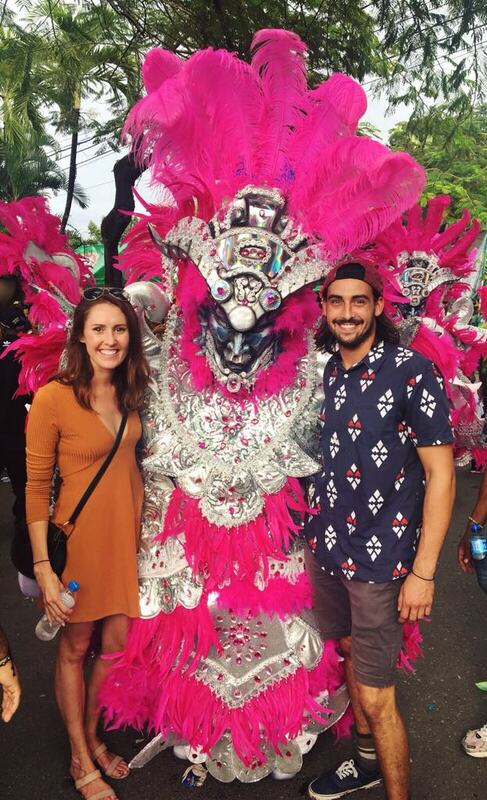 If you come in the winter, you might have the opportunity to experience Carnaval. This is a Dominican festival outside the city where you can find the streets lined with food and drink vendors, music, and dancing. 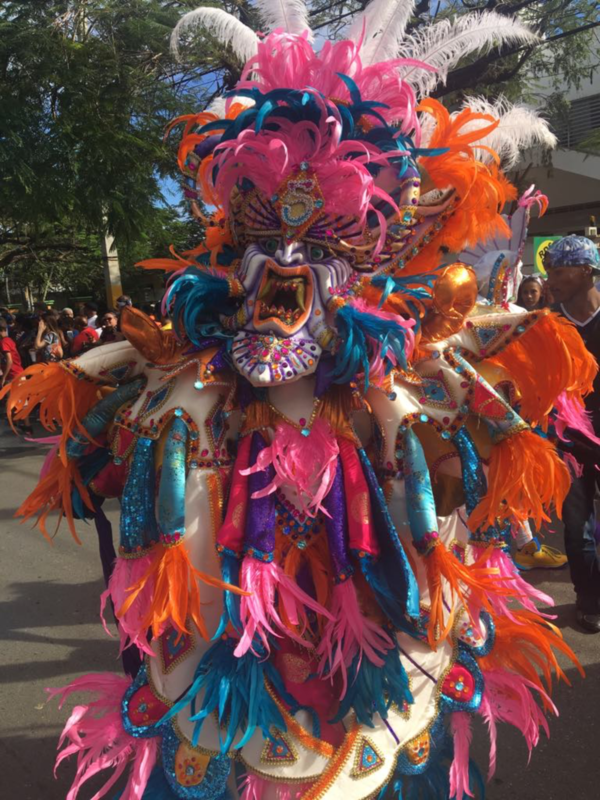 There is a huge parade with insanely colorful and elaborate costumes. This was one of my favorite true Dominican experiences so far. With all of those activities being amazing adventures, my favorite so far has been chasing waterfalls. 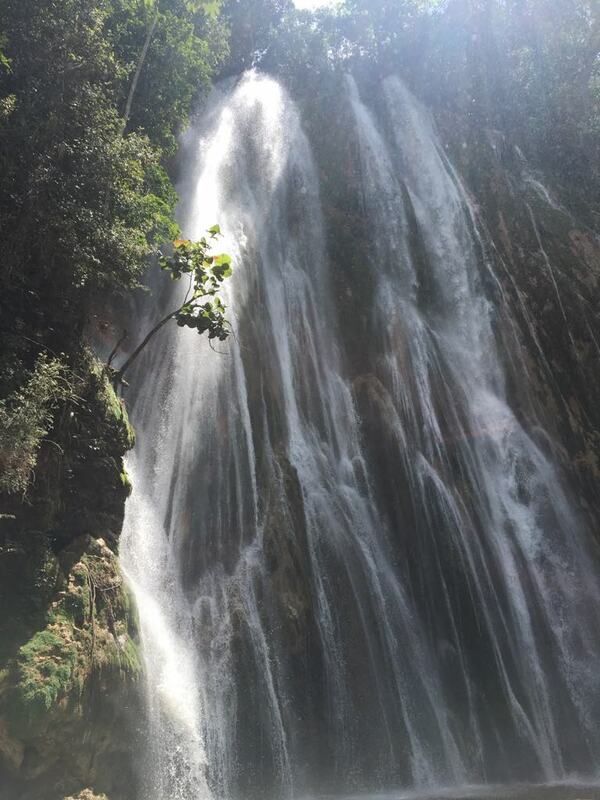 There are many waterfalls on the island, even the tallest waterfall in the Caribbean! 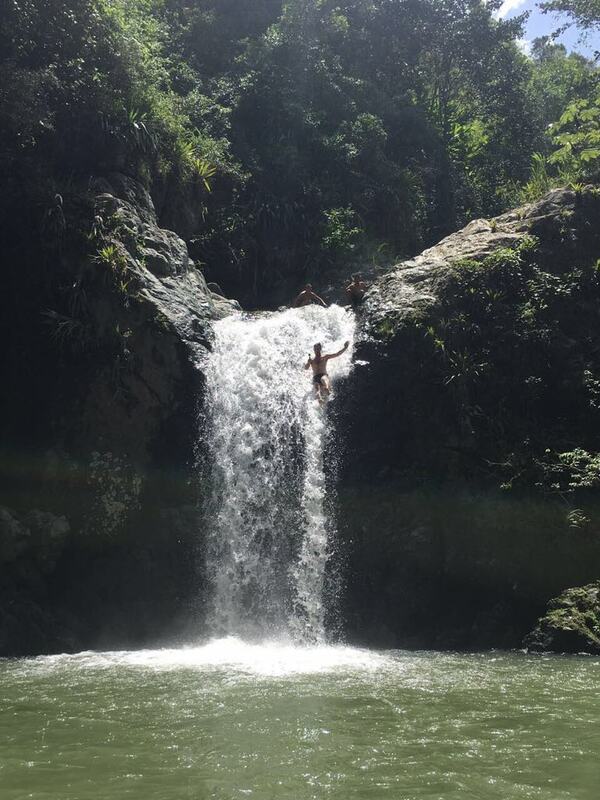 The majority of the waterfalls are up north near Cabarete and Puerto Plata. There is even an excursion called “27 Waterfalls” where you can hike to, jump from, and swim under all the waterfalls you can imagine. What did you learn from the locals, their culture, and lifestyle? I think the people are the most fascinating part of the country. There is so much poverty yet everyone always seems happy. They are always willing to work together to support friends, family, and even total strangers like me! It is really something to admire. Dominican culture is very relaxed yet hectic at the same time. I must admit, getting used to “island time” was a little difficult at first. Because of the fact that this is a developing country, some restaurants and stores lack online information. It has been a challenge getting used to the strange hours and siestas that many restaurants take. I am very thankful that the people are so friendly because I often find myself asking questions about when and where to eat. You just have to accept the fact that if you choose to eat out at a restaurant, your food may take longer than in the States because they really like the social aspect of sitting and enjoying time with friends. The food comes second to good conversation. Everyone really takes their time and fully live up to the slow-paced lifestyle. You will often see people just hanging out on street corners, sipping coffee and chatting with friends. There isn’t much hustle or bustle throughout the work week, except for on the interstate. The roads can get pretty crazy during rush hour due to the high volume of people that live in the city. Outside the city, the roads are just fine. I love Dominican food! It is really simple and not very spicy. Anyone will be able to find something to enjoy here. The absolute best part about living on a tropical island is all the fresh fruit. You can purchase fresh fruit for next to no money on every street corner. My favorite fruit to eat here is chinola. It is passionfruit and they use it in everything from juice to ice cream. Chinola is delicious! Some of my favorite meals to order at restaurants include chicken and rice or Caribbean fish. Fried chicken is very popular here and Dominicans can make a mean fried chicken. It is seasoned perfectly and flash fried so that the skin is really crispy but the inside is still juicy. It is always served with rice and fried plantains called tostones. Caribbean fish is cooked similarly to the chicken. It is flash fried whole and topped with pickled peppers. It is the best way to eat fish! Any tips for future visitors?I would definitely recommend doing some research prior to arriving. Like I said, the internet can be a little tricky to navigate and many small towns can have spotty cell service. Make sure you know where your accommodations are and have a general idea of where you want to go so you don’t let loose. It wouldn’t hurt to learn a little Spanish too. Along with that, I can’t say enough good things about the Airbnb rentals here. There are so many amazing homes and apartments to stay in that will save you money. The people who own the buildings are always willing to help make your stay as perfect as can be. Finally, take advantage of the size of the island! If you are here for a week or more, you will have plenty of time to explore more than one town. My favorite places are up North. Spend a few days in each town, then drive an hour or two to the next. You will get the full Dominican experience as well as the opportunity to do more activities. Living in the Caribbean opens doors to many other islands. Of course, I will continue to explore all corners of the Dominican Republic. But, I am also planning on traveling to Cuba in the near future. I would love to visit Havana and experience the culture and lifestyle there. One of the best decisions I have made since moving here is starting my own blog! You can read all about my adventures as well as some travel tips and tricks at Que lo que. I try to post once or twice a month. I would love to connect with other travel bloggers! You can also follow me on Instagram at emily__cecilia. I post most of my pictures there! A special thanks to Emily for sharing her experience in the Dominican Republic with all of us! This was very rewarding and your stories, very entertaining and enlightening. @Explorers, Don’t miss out her page! The beauty of Haiti – Here. 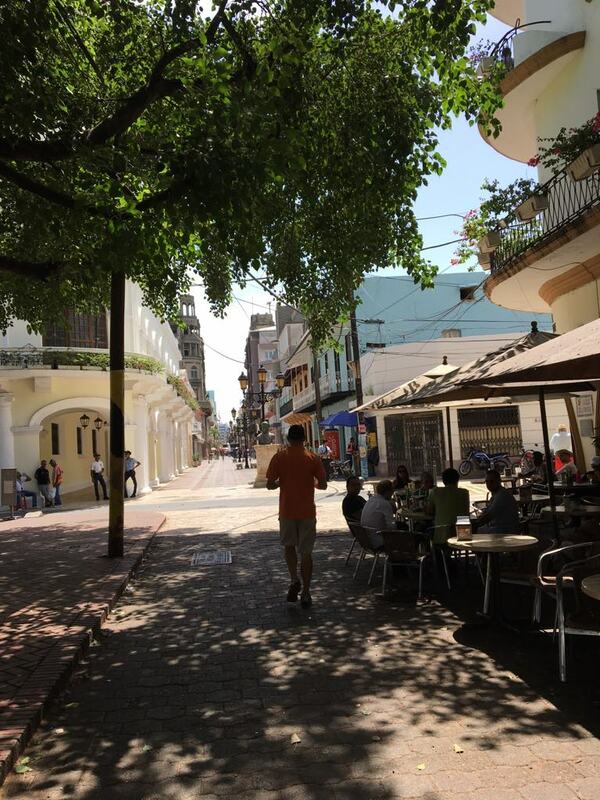 Cuba (corner to corner) – Here. Please do so! Won’t disappoint! Thanks for stopping by. If you ever want to share something about Venezuela, don’t hesitate and contact me! Thank you, but Venezuela is going through very rough times right now.